Pure Storage has moved away from SSDs in giving its FlashArray an NVMe makeover, halving its latency and doubling its bandwidth. The new FlashArray//X takes inspiration from the unstructured data FlashBlade’s proprietary flash drives and re-implements these in NVME flash form to build an updated FlashArray//m. 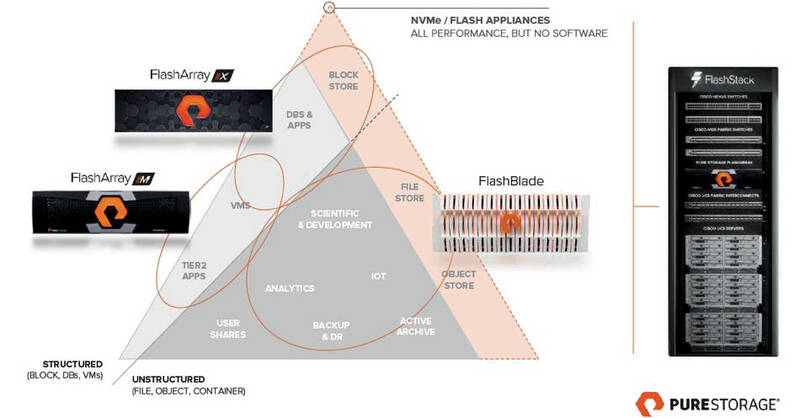 A FlashBlade storage blade has 8 or 52TB capacity, on-board NV-RAM, super-cap protected write buffer, an FPGA and two ARM cores, and is connected to its parent system with PCIe and a proprietary protocol. The FlashArray//X storage blade equivalent is called a DirectFlash module and there can be two of them. It still uses a PCIe physical connection but with the NVMe protocol. By sidestepping SSD use, Pure says it avoids data access being slowed by an SSD’s Flash Translation layer, garbage collection, and disk-based encryption and error correction. Telemetry data sent to a Pure cloud every 30 secs. The FlashArray//M features 1.9, 3.8 and 7.6TB flash drives. Block-level telemetry, bad block management and encryption. The supplier claims this makes its Flash Drive implementation 15 to 30 per cent more efficient than the equivalent population of SSDs, meaning less over-provisioning and better endurance, as well as providing data access latency in the 100s of microseconds area. Compared to Pure’s FlashArray//M, the //X should have half the latency on workloads featuring a 65/35 read/write mix with snapshots, and twice the bandwidth. Pure says it should deliver maximum performance from 10 FlashDrives modules. Pure all-flash array product marketing pitch. Embiggen by clicking the image. Pure’s marketing pitch for the FlashArray//X centres on it being ready for the cloud era, but there’s no connection with the IPO-chasing Cloudera. It suggests the //X can be used for tier 1 storage consolidation, database acceleration and a top of rack direct-attached storage replacement for a bunch of servers in the rack. The servers would be running apps like Cassandra, REDIS, Splunk, MongoDB, MySQL and the like. The //M can be used for VMware, Microsoft, Docker and OpenStack work with the //M10 being the entry-level box for things like Windows Servers’ work. FlashBlade is then sitting there ready for the unstructured data storage applications such as analytics. Pure Storage has fulfilled its promise to add NVMe drives inside its FlashArrays and so gained useful decreases in latency and increases in bandwidth. That’s not unexpected. What is a little surprising is that it has doubled down on its proprietary flash module design, introduced with FlashBlade. It has taken SSD-level functionality such as garbage collection, over-provisioning for endurance, error correction, etc, and provided them globally in the array as software running in the array controllers. This brings, it says, savings in over-provisioned flash cells and also better endurance. The 1PB effective capacity claim, for a 3U FlashArray//X filled with 20 x 18.3TB FlashDrives, seems optimistic except for the most deduplicatable and compressible workloads. Pure says that this 1PB of effective is based on all overheads and the average data reduction that they observe across the entire fleet.